ORTELIUS - Titlepage: Nomenclator Ptolemaicus..
ORTELIUS, A. 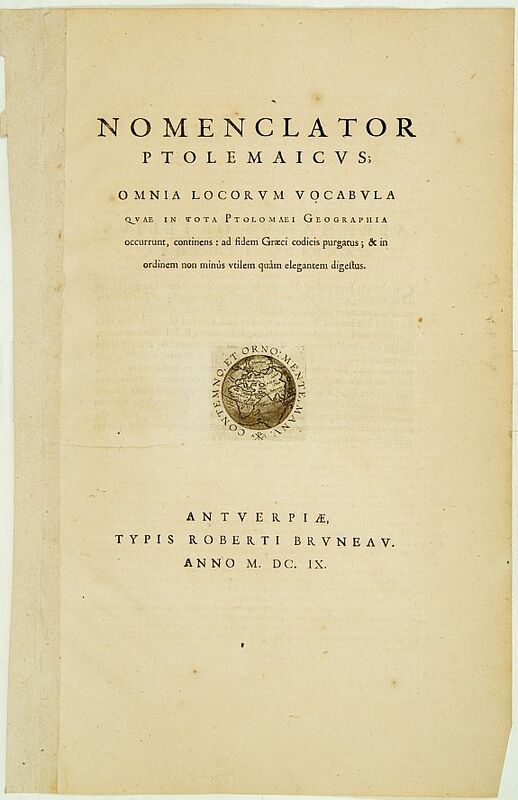 - Titlepage: Nomenclator Ptolemaicus..
Titlepage: Nomenclator Ptolemaicus.. - ORTELIUS, A. Size : 18.7 x 11.8 inches. / 47.5 x 30.0 cm. Description :Title page from a Ortelius Atlas part called: Nomenclator , containing a register of place names in antiquity. Letterpress with copper engraved print (60x60mm) of the eastern globe, including a large south continent and part of California. Condition : A good impression.